RCC Structures are nothing but reinforced concrete structures. RCC structure is composed of building components such as Footings, Columns, Beams, Slabs, Staircase etc. These components are reinforced with steel that give stability to the structure. Staircase is one such important component in a RCC structure. In this article, we will discuss different types of staircases and study the dog-legged reinforced cement concrete staircase design. Stairs consist of steps arranged in a series for purpose of giving access to different floors of a building. Since a stair is often the only means of communication between the various floors of a building, the location of the stair requires good and careful consideration. In a residential house, the staircase may be provided near the main entrance. In a public building, the stairs must be from the main entrance itself and located centrally, to provide quick accessibility to the principal apartments. All staircases should be adequately lighted and properly ventilated. In this type of staircase, the succeeding flights rise in opposite directions. The two flights in plan are not separated by a well. A landing is provided corresponding to the level at which the direction of the flight changes. 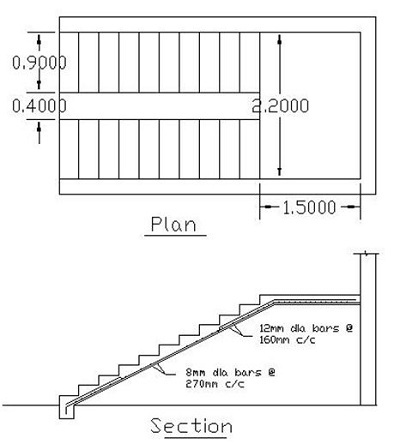 Based on the direction along which a stair slab span, the stairs maybe classified into the following two types. These stairs are supported at each side by walls. Stringer beams or at one side by wall or at the other side by a beam. In this, stairs spanning longitudinally, the beam is supported ay top and at the bottom of flights. For the efficient design of an RCC stair, we have to first analyse the various loads that are going to be imposed on the stair. The load calculations will help us determine, how much strength is required to carry the load. The strength bearing capacity of a staircase is determined on the amount of steel and concrete used. The ratio of steel to concrete has to be as per standards. Steel in the staircase will take the tension imposed on it and the concrete takes up the compression. These are the essential steps that are to be followed for the RCC Stair Design. I find this site educative. Thanks to the providers. Staircase design needs care and is very important to know what it’s functions are. We ought to know that it must be fire-proof. In fact, it requires space for easy movement of individuals and furniture, cos it’s a fire escape root. Though commercial buildings requires much space than the residential buildings but really, space is required for easy access. Concrete mix ratio depends on the quality of the material used and the environment. Topography matters. staircase creation in any building depend on the type of stair and purpose of that structure. Tread width 1200mm depending on the usage. and using normal ratio of 1:2:3 of concrete mixture and also mixed verry well and not to wait to regain more strainght and also the reinforcement spacing should not excide 4 to 5inches bot main and distribution bars and well fixed in the walls and well ancord inside the columns and living openings for handrails before casting. We are constructing stairscase for residential building. Below is specification. Please check is it correct? what is the standard size of tread depth,width and riser? design an open newl staircase for an office building in a room of inner dimension 3.25×3.25.width of stair =1m.floor to floor height=3.60m.stair has to be provided along all walls and all four flights carry equal number of steps.draw the plan and sectional elevation of any one flight. this is different from what i read in textbook,are they still the same thing? Different books talk about different procedures of design. But the design outcome is the same. You can embrace whichever method suits you and you find it easier. I want to know the steps of design fabric building which has dynamic load and static load.excuse help me. WOW… I never realized that there are actually different “types” of stairs! they all look the same to me.. how is a dog legged stair case different from a straight stair case??? I found this site very educative.i am just a beginner in civil engineering field but i have accumulated a lot of ideas for future references.thank you once again. what unit we use with total load in horizental and longitude stair? I want to know , how to calculate reaction in beam. fantastic site, very good details provided..
i need to design stairs lay on the ground (outdoor stairs) w/ 5-20m difference in elevation. what analysis should i used? Can you pl. share details of precast stringer beam? Thank you for your kind words of appreciation Nusrat! Shear reinforcement is provided in the beam. Shear reinforcement prevents the beams from breaking into two pieces because of load. The load from the slab is transmitted to the columns and beams and then to the foundation. Hence, the slabs do not require shear reinforcement. I would like to be upgraded with the regular information about structures. I want to know the minimum width of tread & minimum dia of steel reinforcement to be used in the stair. The minimum width of the tread for a stair should not be less than 25cm. The minimum diameter of steel reinforcement to be used in the staircase design should not be less than 6mm in diameter. I hope I have made it clear enough. I need the reinforcement detail of combination of straight & semi circular stair. AND CIVIL ENGINEERING WORKS PART-1. hey, how can i get back to you for more querries apart from Gravatar? i want to calculate tthe qyty of cement steeletc. i need one detail that is design of waist slab and landing is only the same thing or we have to do supperate design for landing slab or not? give the genral thumb rule for designing of structural element& u have give great information of designing of slab,staircase.